We’re quickly approaching the start of blueberry season and also the Fourth of July holiday. Coincidence? I say not. 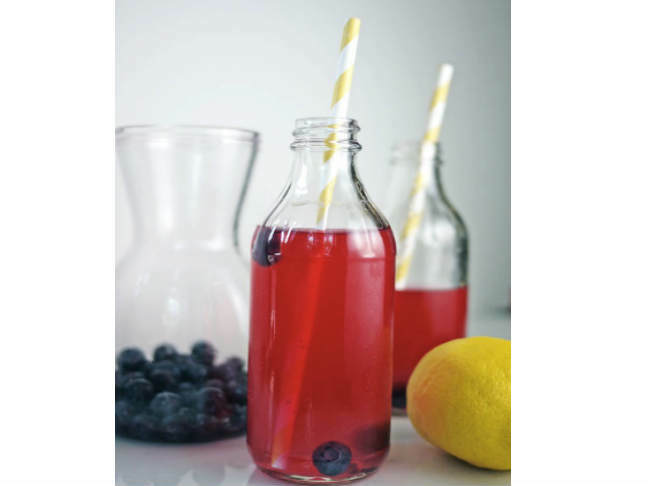 And I’ve got a festive recipe for Blueberry Lemonade perfect for your 4th BBQ to prove it. From what I hear, this year’s blueberry season is looking to be a good one. If that’s true, the blueberry patch had better watch out for me because I plan on stocking up for blueberry pie, bluberry cake, super summer blueberry breakfast action, and this simple blueberry dessert sauce (which, like fresh blueberries, freezes beautifully). Before all that, though, I want to start simple. I want to sit back, relax, enjoy the Fourth of July with family and friends while sipping on this festive (and patriotically hued!) Blueberry Lemonade. 1. In a 1-quart glass measuring cup, combine sugar, 2 tablespoons of the blueberries, and ½ cup of water. Microwave on high until hot, about 1 minute; stir until sugar dissolves. 2. Add lemon juice, and enough water to make 1 quart; chill. 3. Fill tall glasses with ice cubes, add chilled blueberry mixture and remaining berries, dividing equally. Garnish with lemon slices if desired. To read more from Stacie Billis click here. You can also find Stacie Billis at One Hungry Mama and on Facebook, Twitter, and Pinterest.